When Shelly F. Greenfield joined the Harvard Medical School faculty in 1992, scientists were just beginning to document the fact that men and women become addicted to alcohol, and recover from that illness, differently—to recognize that “there may be gender-specific variables that affect health,” says the professor of psychiatry at McLean Hospital. During the last 15 years, scientists have documented notable gender differences in the physiological effects of alcohol—differences summed up in Women & Addiction, a 2009 volume co-edited by Greenfield, who has pioneered more effective treatment programs for women struggling with addiction to alcohol and other substances. Women initially metabolize only about a quarter as much alcohol in the stomach and intestines as men do (a fact not documented until 1990); consequently, more alcohol enters the bloodstream as ethanol. Women’s generally lower body mass, and lower body water content, also act to intensify alcohol’s effects. Due at least partly to these physiological differences, the disease of alcohol dependence proceeds on a faster course in women, requiring medical treatment four years sooner, on average, than for male problem drinkers. Alcohol-addicted women are also quicker to develop cirrhosis, fatty liver, and cognitive impairment, and have a greater risk of dying in alcohol-related accidents than men do. These gender differences are not confined to humans: female rats become addicted to a wide range of substances, including alcohol, nicotine, cocaine, heroin, and methamphetamines, more quickly than males. Epidemiological data suggest why earlier studies of alcoholism used mostly men: as recently as the early 1980s, the ratio of alcohol-dependent men to alcohol-dependent women in the United States was 5:1. By the early 1990s, though, that ratio had narrowed to 2.5:1—a trend mirrored in Europe. A common explanation blames changing social norms: for women to drink in public or talk about having a glass of wine with dinner at home became more socially acceptable, even fashionable. 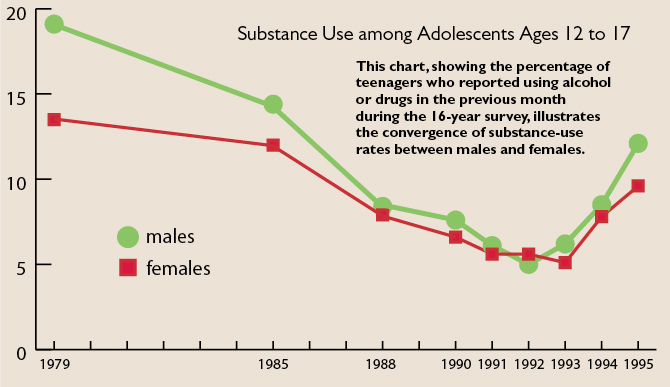 Data on the age at which teenagers first try alcohol also reflect this cultural shift: girls used to wait much longer than boys to take their first drink, but since the 1990s, that gap, too, has disappeared. The male-female gaps have narrowed not only for alcohol but for other substances—a fact that has made Greenfield’s work increasingly important. Taking issue with the notion that addiction treatment strategies developed for men will work equally well for women, she and colleagues have developed a treatment manual with a focus on issues specific to women—for example, their tendency to act as caretakers, sometimes to the exclusion of their own needs. A pilot study of this woman-centered approach found it to be just as effective as a typical, mixed-gender, 12-week treatment program during the course of treatment; more significant are the results indicating that after six months, women from the all-female group continued to improve, whereas women in the mixed group were likely to have relapsed. Women with “low self-efficacy” (a lack of faith in their own ability to stay clean), who have proven more vulnerable to relapse with typical treatment, did best in the all-female treatment group, faring even better than women with greater self-confidence. Perhaps, says Greenfield, the woman-focused program, administered in a single-gender environment, “isn’t important for all women, but will be really essential” for some. Greenfield believes the combination of woman-centered content and group dynamics are what make her treatment so effective. In the all-female groups, “From day one, people shared personal information very quickly,” she reports. “There seems to be a kind of bond of understanding.” Seeking to quantify the dynamics of this supportive environment, Greenfield and colleagues are monitoring so-called “affiliative statements” in the different treatment groups by tallying how many times one group member voices support or empathy for another. In particular, tabulating the dynamics of the mixed-gender groups enables them to compare the flow of these statements between men and women.